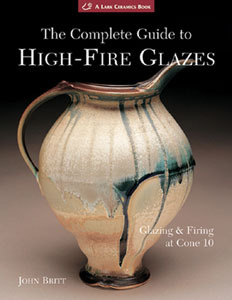 With hundreds of recipes for some of the most popular and enduring high-fire glazes, this reference will prove a boon to ceramists who want to master this complex and versatile aspect of the art. Author John Britt, who served as Clay Coordinator at the respected Penland School of Crafts, has personally tested many of the recipes, and carefully reviews every one. He offers a thorough examination of glaze materials, chemistry, and tools, and presents the basics of mixing, application, and firing procedures. There’s a wealth of information on various type of glazes, including copper, iron, shino, salt/soda, crystalline, and more. An exhaustive index of subjects and a separate index of glaze recipes will help ceramists find what they need, quickly and easily. John Britt has been a potter and teacher for over 28 years. He lives in mountains of western North Carolina although he grew up in Dayton, Ohio. John is primarily a self-taught potter who has worked and taught, both nationally and internationally, at universities, colleges and craft centers, including the Penland School of Crafts where he served as the Clay Coordinator and then, as the Studio's Manager. He is the author of the "The Complete Guide to High-Fire Glaze; Glazing & Firing at Cone 10" which was published by Lark Books in 2004, was the juror for the book; "500 Bowls", Technical Editor for "The Art and Craft of Ceramics", and has written numerous articles for ceramics publications including: Ceramics Monthly, Ceramic Review, Studio Potter, Clay Times, Ceramic Technical and The Log Book. He is currently a studio potter in Bakersville, North Carolina and teaches glaze chemistry, throwing, kiln building, glazing and firing workshops.